Within previous few months, 3D Touch has unfolded several new features such as touch sensitivity, peek and pop, 3D Touch disabling, live photos, home screen actions, application switch and much more. Along with the above iPhone 6s offers 3 D touch trackpad which is another commendable feature. Now, if you want to know how to use iPhone or iPad keyboard as trackpad with 3D Touch then keep reading our article and be familiar with topic. For your kind information I would like to tell you that iPhone 6 doesn’t provide the separate trackpad, however with the assistance of 3D touch your keyboard may transforms into trackpad. 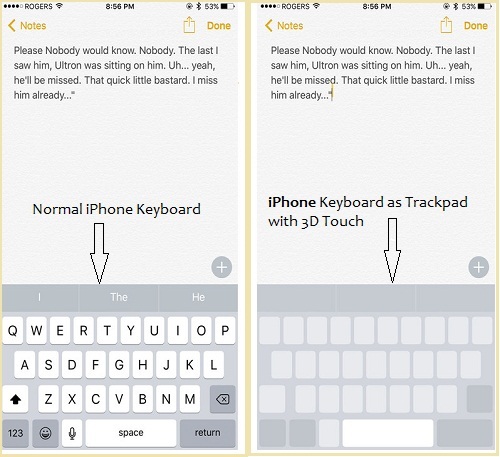 You may alter your iPhone’s keyboard into the trackpad by just holding two fingers. This is one of the best feature in which user may type mail application, messages as well as on social media such as Instagram, Facebook, Twitter. Step #1. Go to above mention any applications on your iPhone 6s and write your text message there. Step #2. Press the keyboard and hold it for a while. Now, you will be asked to Enable your iPhone 6s Trackpad. You just need to tap it on ENABLE button. Move the cursor on the screen without taking your finger off. Step #3. If you choose any text, press deeper. If you’ve completed your task, you can take your finger off from the trackpad and it’ll back to the keyboard mode. Take the benefit of this amazing feature on your iPhone 6s and iPhone 6s Plus. Your finger must be constant while contacting the display area. The mouse pointer moves according to the movement of your finger such as up, down, right and left. Let your finger free from the screen to leave the pointer on its present position.